I have an amazing team of demonstrators around me. 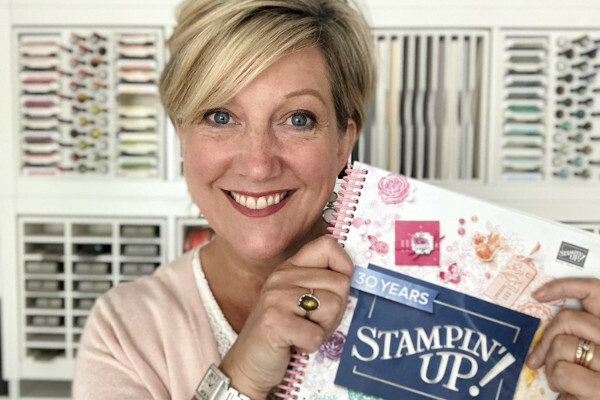 I have been a Stampin’ Up! demonstrator for nearly 10 years and there is nothing I like more than to reward and recognise my team. All my team are valued and play a role in our team and when its time to make something pretty to reward them that makes me happy. I recently took a trip to Frankfurt which is where the Stampin Up European head office based. I have been holding a team training program to help people reach a specific title and the reward for reaching that title whilst being in the program was to visit the Head Office and Warehouse with me and Sam Hammond. 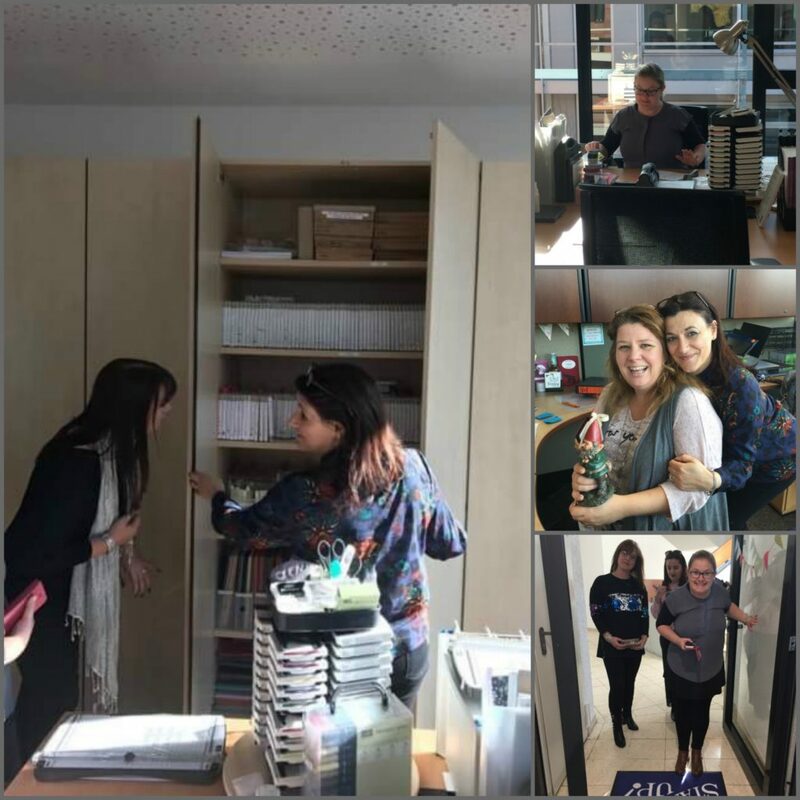 I had never visited the head office before and it was a treat for me as much for the lovely Katy, Amanda and Sophie and we had a blast! I wanted to give the girls a pillow gift and a memento to remember their achievement and I decorated the boxes with the Labels to Love stamp set in the seasonal catalogue. I stamped the green flourish using a stampin write marker so that I did not stamp the ‘Give Thanks’ greeting. I then stamped ‘Celebrate a wonderful year’ in the centre. 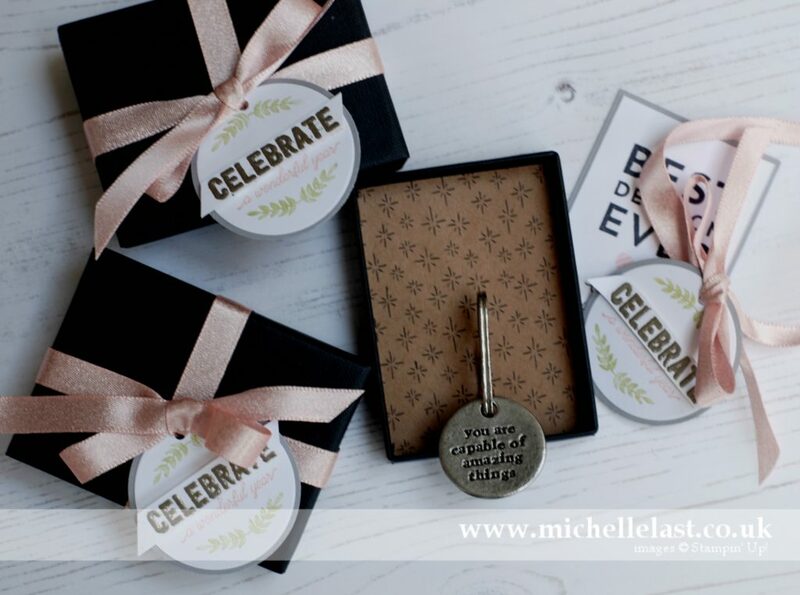 I heat embossed the word celebrate in silver embossing powder and cut around it and raised it up with small dimensionals. The keyring had a star on the front because all the girls are little stars and on the reverse is says ‘ you are capable of amazing things’ because they truly are! And finally I added a little note with Best Decision Ever on it and a personal message on the back from me and Sam. So do you want to see what we got up to on our trip to Frankfurt? We all flew in from different airports to Frankfurt and arrived at our hotel for a lovely dinner and a few cocktails before what was supposed to an early night! Early the next morning we headed our to the Stampin Up warehouse which is approx 15 minutes from the offices of Stampin’ Up! 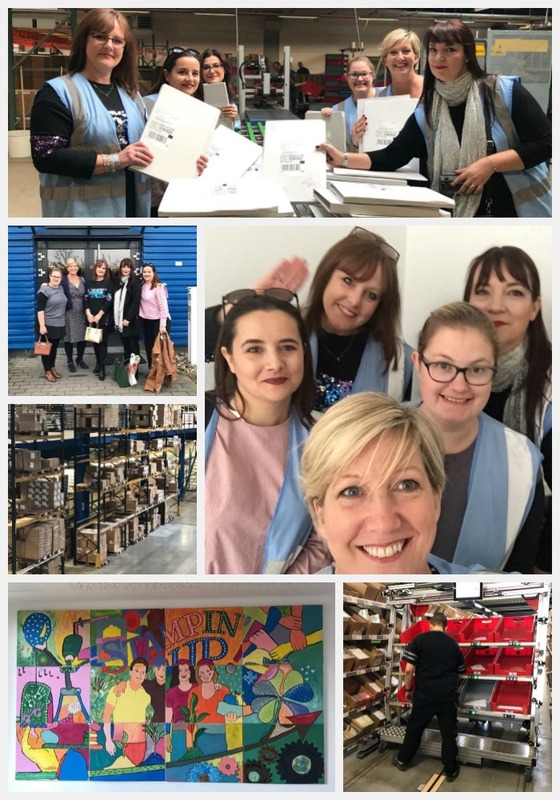 and had a look around and saw how they pick pack and deliver our lovely Stampin’ Up! goodies. We had a chance to sign any packages going out to fellow demo’s and teamies which was lovely when a couple of days later people were saying they loved receiving their goodies with a hand written note. There were rows and rows of products and it was incredible to see how they orders are picked. Check out the bottom right of the top collage to see several orders being picked on the automated picking line. The staff were lovely and very patient with us whilst we kept getting in the way. The lovely Silvana was our lovely warehouse host and did a wonderful job. Next stop was the head office where the demo support, accounts, support staff and business development managers are based. I have spoken to demo support lots in the last 10 years but never have I actually seen where they work and its so much nicer now that I can picture where they are! At the head office there is a whole room dedicated to being creative! In those tall cupboards there are rows and rows of supplies and stamp sets, it was like being a kid in a sweet shop! Our three little achievers went mad for the door mat! We had a lovely lunch and made a lovely little album so we even got to craft too! Such a lovely experience and such a fun reward. PS Don’t tell anyone but this is supposed to be ‘work’! It was a whistle stop tour and over far too quickly but the memories will last a long long time! 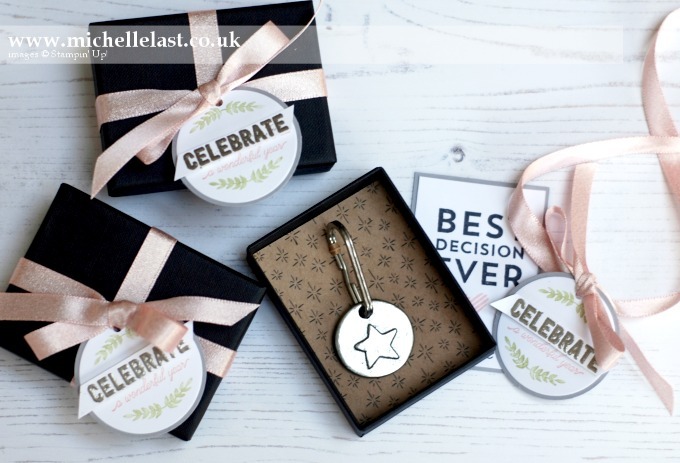 The products I used to make the gift are listed below, if this set takes your fancy there is a matching punch available too – happy shopping!